I agree with everyone else. Awesome project. Plenty of skills.. gaining experience..
Wow - incredible. You have really good workworking (and other) skills. Love this cab. Dude, Where have you been?! I’ve wondered how your basement remodel went. Post an update. I'll see if I can find that old old old thread I started and post some pics of the final basement. Hey guys, thanks for the kind words. If there’s anything I’ve learned from this project it’s that with enough determination and effort you can build a nice cabinet to be proud of no matter your baseline skill set. The support offered on this forum is very encouraging; I hope that this project can help continue that trend. I should have an update very shortly! Work, jury duty, and other things have sidelined leisure activities to a degree, but I have been working on the frontend and other computer related things behind the scenes. Back with the final major update for this build! So shortly after finishing the marquee I started with what was one of the most satisfying steps: installing the side art. Part of the reason why it took so long to get to this is that I made a crucial error in inputting my measurements when creating the artwork dimensions. One of the corners was 1” off, which affected the slant of the border that lined the monitor opening. Consequently I had to reorder both sides from Brad. It was painful, and…well, my wife wasn’t happy ($$$). But I’m dedicated to publish the reality of this process so I didn’t want to hide anything; hopefully others can learn from mistakes like this lol. Now if you’ll kindly gloss over that small detail let’s get to the meat and potatoes of this post . I’m sad to say that I was too nervous to take pictures during installation of the side art. My only willing “helper” is 5 years old, so with it being a one man install and learning during my first attempt at this I was too worried I would mess something up. I know, it would have added to the entertainment factor of this thread, so I’m sorry for that . The material that Brad (known as Lucian045 around here) uses for his prints is very user friendly. There were a few times I had a bubble that I thought would cause a problem, but they smoothed out perfectly with just a few passes with the squeegee. The painter’s tape worked great and I was able to use and reuse the same strips just moving them as I went. I love the Power Glove. It's so bad. Your cab is beautiful, Krangbrain! I freakin love this thing. Outstanding job. This would be my UCA nominee, if UCAs were still a thing. You did good. Stunning work and inspiring! Great job all around and on the artwork. Truly nice stuff! We may need to see some action shots too! yeah - definitely need to see a video of this thing booting up, the front end, the insides, etc. Thanks so much for the compliments, guys! It's been said countless times on these forums, what's most important it making something that you yourself will love, but it's nice to hear others approve as well. I'll definitely get some action shots up! I'm still tidying up the inside. Originally I just plopped the computer right in the cab, but I'm either going to disassemble it and mount the components (which I'm leery of for cooling purposes), or create a mount for the computer tower like bperkins01 did with his Lakeside Arcade project. Also, I have to have a serial plate for this. I haven't looked but I imagine I can find a template for this on these forums or online. A quick search turned up this page. The SW cab used Atari serial and patent number stickers . . .
. . . and a third sticker. You can order the first two from this KLOV thread. If you find/make a template to go the DIY route, CoryBee has a good tutorial on making serial plates here. I really like the artwork on this cab. "A day without Laughter is a day wasted"
In all seriousness that is one stunning job. Well done! Every normal man must be tempted at times to spit on his hands, hoist the black flag, and begin to slit throats. Out of curiosity,which Star Wars game do you play on this cab? It is a work of serious wonder. I love the side art,the bold outer edges didnt follow the CP or marquee protrusion,but the x wing did.Beautiful.I might have missed it in the long thread,but is vaders tie fighter anywhere?the one that gets a near miss on the lower side would have been a great place. Thanks Scott. I'm thinking of going the DIY route. 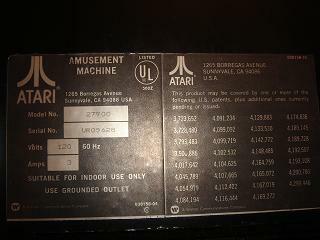 It would be nice if I could find a template of the Atari "Amusement Machine" plate and make one of those. I'll have to do some looking online. I'd like to avoid making it from scratch if I can. It is a work of serious wonder. lol a fair question. I find the original 1983 SW, 1985 ESB, SW Arcade and SW Trilogy Arcade games fun to play with the trackball. (I know, I speak heresy here.) I also enjoy playing the SW games that came out on SNES. Mate,you should be proud of what youve produced. Till my dying day i will never forget a friend of mine,he was quite a fast runner and got to the arcade before me most lunch times,when we´d left school,at tech college in southport.after getting in the seat and getting comfy as we all did before inserting coin he cried out.What chance do we stand against the empire with these slippery assed seats. No, I didn't include Vader's TIE in the artwork. I thought about it, but decided against it for a few reasons, but mainly because of the time it would have taken. I don't regret it now, and hopefully I won't in the future. Thanks for the kind words! PM me, I might have what you’re looking for. Special thanks to Yotsuya for hooking it up with the Atari serial plate. I modified it to suit my cabinet's theme. Should I have kept the Atari logo? I went back and forth on this cause the only thing "Atari" on this cab is the profile. Well, and Atari produced the original SW game, too. Is that 3 Amp rating correct for your entire cab? Lol! Yeah, I should change that. I imagine 15 is more realistic since that's what was put on other diy plates. TBH I'm clueless when it comes to this part of the build. 3 might be right - you're not running a CRT. If I remember right, I measured Mimic at 2.3A with two LCDs in it. I imagine 15 is more realistic since that's what was put on other diy plates. TBH I'm clueless when it comes to this part of the build. 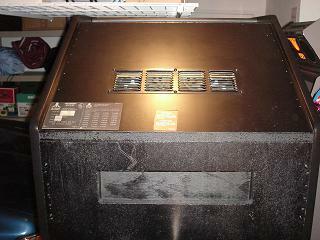 15 Amps * 120 Volts = 1800 Watts. If you can make a list of everything that draws current in your cab and whatever Watts/Voltage/Amps/part number/manufacturer info you have for those items, I'll help you calculate a reasonably correct value. +1 - get all the wattage together and you will be real close..
You can bump that up to 6.6A if you want to allow an additional 10% current surge when you first apply power. Wow, way cool of you to do that, Scott! Thank you! And thanks for breaking it down for me. That'll come in handy for the next build. This thing oozes class and craftsmanship. What an inspiration. Page created in 0.271 seconds with 61 queries.